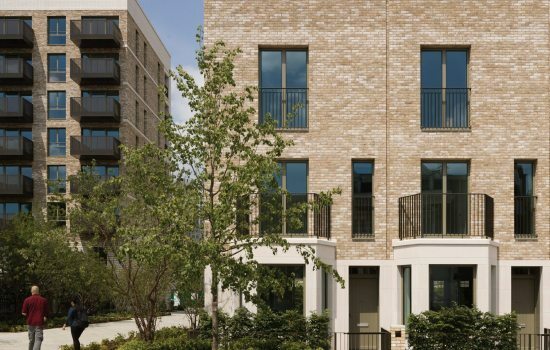 South Gardens creates accessible, useful and beautiful shared ground level courtyards and upper floor roof terraces where residents can both feel a sense of ownership of their environment and engender a sense of community. These are augmented by generous private inset, projecting and bay balconies, loggias, gardens and terraces. Spaces for a variety of activities are provided, from social gatherings between neighbours to secluded niches set within planting for quiet contemplation. These spaces consist of an array of plant layers from large trees down through to a mid-canopy layer of small fruiting trees and shrubs to a flowering herbaceous boarder and areas of floral lawn. There is a roof level Grow Garden where residents can grow their own plants and vegetables. The scheme was granted planning permission in February 2014 and formed the first Reserved Matters submission to be made pursuant to the outline planning permission for the Heygate Masterplan, which was granted consent in March 2013. The outline planning permission approved the mixed use redevelopment of the Heygate Estate to provide up to 2,469 residential units; up to 16,750 sqm of new retail floorspace; 5,000 sqm of business floorspace, 10,000sqm of community, culture and leisure floorspace; a new energy centre; a new park; and new public realm. The outline planning permission established a series of key parameters and principles for the wider site, but reserved details relating to access, scale, appearance, layout, and landscaping are reserved for future approval via Reserved Matters applications.